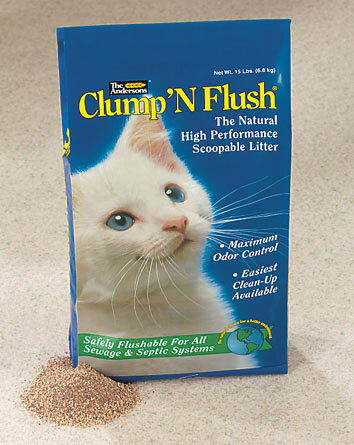 Clump 'N Flush Cat Litter 7lbs - pine scent [CF01] - HKD118 : PetPetMaMa , The Best Products for our pets! •Maximum Odor Control - All natural corncob particles trap odors quickly. •Safely Flushable - Won't harm toilets or septic systems. No clogging or residual buildup. •Lightweight - Half the weight of clumping cat litter with the same number of uses. Easier to carry and dispose of. •Exclusive Corncob Formula - Absorbs more than four times its own weight. •Fast Clumping Formula - Hard clumps form quickly, eliminating sticky, messy cleanup. 1.Fill litter box with at least two to three inches of Clump 'N Flush. 2.Scoop out clumps and solid wastes daily. 3.Flush clumps and solid wastes in toilet. 4.Refill box to the two to three inch level.